Mount Etna and its natural surroundings are unique in nature. This is still "breathing" crater is the oldest across Europe, with its height of 3323 meters above sea level, it is the highest volcano in Europe. The very peak of Mount Etna is the highest in all of Italy, south of the Alps. But its size varies. Today it is 21 meters lower than it was in 1981, the volcano is the largest tourist attraction in Sicily. It is located in the eastern province, near Messina and Catania. This annual "exhale" of volcano Etna connects several beautiful legends. One of them said that its foot was actually born Venus . According to another – it is a crater of the blacksmith god Hephaestus and home of the one-eyed Cyclops. The most romantic legend even states that under the volcano marry only the lovers, whose strength of feeling can be compared only with a firestorm. Throughout its history, Mount Etna has erupted about 135 times. Today, residents in the area of Etna do not worry about the overwhelming force of lava and volcanic ash. 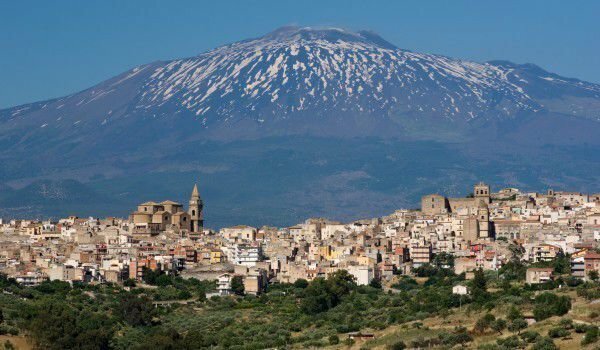 At the heart of Etna, it has a lot settlements, but construction on the slopes of the mountain is not widespread. Mostly because they do not know which place will eventually crack in the mountain after an eruption. However, this does not stop some developers to once again raise hotels in the place where they have already been destroyed once. The reason for this is that with the year-round stream of tourists here, each investment returns. The last catastrophic eruption of Mount Etna was in 1669 when the province of Catania was completely removed. Today, however, the millions of tourists in the area are not concerned about the destructive power of volcanoes. Another story claims that here descend the best skiers from around the world, because only they can escape from the lava. In fact, here is a paradise for skiers during the winter months, but for lovers of mountaineering and rock climbing, it is excellent year-round. It is covered with pines, beeches, oaks and birches, on the mountain slopes there are numerous hiking trails, walking in which, ensures a real adventure. Besides beautiful landscapes, here you can admire diverse fauna. There are wild cats, barbed pigs, rabbits and many species of lizards and predatory birds. The visit of the volcano Etna, when it shows signs of activity, may not offer the maximum of the natural beauty of the area, because then some of the roads may be closed to passing visitors.